Terry is the best player in the club. With his quick responses and ability to sense the moves of the opposing team, he has an innate feel for winning the next goal. However, because of the physical demands of the game, even he requires an occasional rest. During this time, he maintains readiness for the next session of play. In order for him to be at his best, his muscles must remain limber. His best ally is warmth, in the form of warm up suits. No matter how long a player has been in action, when stopped for even a few minutes, body temperature begins to fall and muscles tighten. To prolong the readiness at a moment’s notice, a player at rest during a game should immediately reach for a loose jacket, even when the air feels above average room temperature. 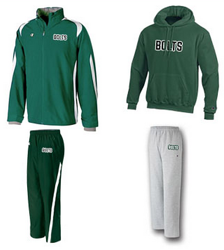 There is a reason you see athletes on the field or court slip on their custom team warm ups between plays. They know that the warmer the muscles are, the longer a body at rest retains freedom of movement without strain. This can easily be the difference between the capacity to easily stretch over an opponent and a pulled muscle - which can bench a player for the rest of the game or longer. 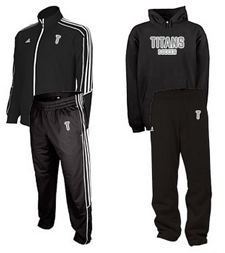 Custom team warm up suits are excellent for short-term inactivity. Pants and long sleeves keep a player at the ready for the next whistle calling a player onto the court or field. Whether inside or outside, a damp overcast day or crowded arena, players need to keep warm during down times. The next move they make could be the winning goal, or could cause a team to lose its strongest asset. Nothing is more disheartening to a player, a coach, or a fan than an injury to a player. When muscles cool, they tend to tighten and shrink - even before a player has stopped sweating from the previous action on the field. Even a slight injury to a most valuable player can debilitate a chance to win that big game or tournament. After all, every game counts! To avoid injury, a club must keep its players warm and limber while they sit on a bench or stand at the sidelines. The warmer the muscles, the more they can flex without strain. The less stress on muscles, the more they are able to work and for longer periods of time. So you see, custom team warm ups are more than just for looks. Though there is nothing that speaks more of professionalism when a team jogs out onto the field in matching colors, the suits provide a whole lot more than just an aesthetic quality to appease the eyes of the audience. They provide a service. And an important one at that. According to the National Institute of Health (NIH), injuries play a major role in sports. Though treatments have been greatly improved so a person may return to a team in record time, the reasons for injury have remained the same for centuries. And one of the many ways to avoid these common injuries is to use the correct equipment. This includes warm up suits. It is critical for a set of muscles to remain flexible during a time out, when a player is substituted, or when waiting for a rain squall to pass for the game to continue. The Centers for Disease Control (CDC) have estimated that nearly 30 million youths now participate in some sort of organized sports across the nation. With this increase has come a rise in injuries. High school athletes alone experience about two million injuries each year. A great number of injuries are completely avoidable, especially those dealing with pulled muscles. According to GR Health, more than ten million injuries each year are caused by sports. And most of them are from some trauma to muscles or joints, and are preventable by wearing the appropriate protective gear. You may not consider protective gear to include warm up suits, but it's clear that warm ups qualify as preventable gear. Athletes and coaches should be aware of the various injuries that can happen as a result of not wearing the proper apparel. So the next time you prepare your team for play or practice, remember this: warm up suits are more than a fashion statement – they are a necessary part of your team’s gear and apparel package. Don’t let a minor muscle strains keep your best player out for days or weeks. Avoid those minor and preventable injuries by keeping your players warm and flexible between plays at your next competition.